Recurrent aphthous stomatitis is the most common chronic disease of the oral cavity, affecting 5–25% of the population. The underlying etiology remains unclear, and no curative treatment is available. Local treatment will suffice for the majority of aphthous ulcers and only in the case of continuous outbreaks and symptoms systemic drug should be prescribed as pain is intense, and topical treatment is unable to afford symptoms relief. Systemic therapy is indicated in such situations with the triune action of providing symptom relief, promoting wound healing, and preventing recurrence. A PubMed search with the keywords of aphthous ulcers and systemic management was done, and all clinical trials and review articles in English literature from 1985 to 2014 were retrieved and compiled. Recurrent aphthous stomatitis (RAS) is a common oral mucosal disease which presents as painful recurrent ulcers.,, RAS shows no sexual predilection and is seen in higher prevalence in younger adults and drops in incidence and severity with advances in age. Though RAS has a multifactorial etiology, immunogenic basis is gaining importance in the causation of RAS.,,,,, RAS has three clinical presentations: Minor, major, and herpetiform. Patient's pertinent clinical history and presentation of the oral lesions establishes the diagnosis of RAS. There have been many attempts over the years to find an effective treatment for RAS. The selection of drugs depends on the frequency of ulcer recurrence, the number of ulcers present, their duration, and the amount of pain the patient experiences. Patients with occasional ulcers, mild to moderate pain may only require palliative therapy for pain. However, in patients where topical management does not provide pain relief and who experience a high frequency of recurrence may require systemic therapy. A PubMed search with the keywords of aphthous ulcers and systemic management was done, and all clinical trials and review articles in English literature from 1985 to 2014 were retrieved and compiled. This article is a compilation of the various systemic agents used in the management of recurrent aphthous stomatitis. Treatment of RAS remains a great challenge. Different kinds of treatment have been attempted over the years, yet no specific management has been established as being the most appropriate. Management of aphthous stomatitis depends on the severity of the lesions. Minor lesions can usually be treated topically with a product that combines a mucosal binding agent and a topical steroid. Topical anesthetics play an important adjunctive role for pain control. In general, a direct application of topical therapy is adequate for mild cases with lesions that are easily reached, whereas patients with more severe aphthous stomatitis or those with relatively inaccessible lesions generally require treatment with a corticosteroid-containing oral elixir. Unfortunately, topical therapy often produces inconsistent response rates and high rates of relapse. Severe ulcers and those not responding to topical therapy may require more aggressive management consisting of systemic corticosteroids, intralesional corticosteroids, or systemic immunomodulators. Corticosteroids may act directly on T lymphocytes or alter the response of effector cells to precipitants of immunopathogenesis. Many clinical trials are not available on oral corticosteroid use for aphthous ulcers and information on steroids are obtained from case reports and case series. Cooke and Armitage in a controlled trial with 2.5 mg tablets of hydrocortisone hemisuccinate observed 50% reduction in the degree of ulceration during the period of the trial, and the reduction could often be maintained for 3–6 months. Initial course with systemic corticosteroid was important for halting bouts and patient's compliance for the disease. Though corticosteroid is a double edged weapon having significant side effects, Ship et al. in several studies have found the side effects to be minimal, especially when prednisone is combined with steroid-sparing drugs such as azathioprine and not used for extended periods of time in the treatment of RAS. When appropriate, alternate day therapy and prednisone intake as a single dose in the morning will help to reduce the drug-related complications. Steroids are one of the few systemically administered drugs that can be used during pregnancy. Insulin tolerance tests and a variety of stress tests (e.g., rapid adrenocorticotropic hormone stimulation test, short synacthen test, and low dose short synacthen test) have been used to evaluate the status of the hypothalamic-pituitary-adrenal axis after a prednisone taper. Levamisole is an immunopotentiating agent that has demonstrated the ability to normalize the CD4+ cell/CD8+ cell ratio and improve symptoms in recurrent aphthous ulcers (RAU) patients. Seven placebo-controlled clinical trials assessed the efficacy and safety of levamisole in patients with RAU. Four of the studies showed a reduction in the frequency and duration of aphthous ulcers during levamisole treatment, with ulcer recurrences decreasing by half in up to 43% of patients. In six trials, a complete absence of ulcers was found at the conclusion of the study in 16 of 144 patients receiving levamisole. Follow-up of three of these studies showed that 20 levamisole-treated patients were without ulcers for at least 103 days, and 4 patients were ulcer-free for 6 months. In five trials, subjective improvement in a majority of patients taking levamisole was reported. The most frequent adverse effects were dysgeusia (21%) and nausea (16%). The other adverse effects occurred in fewer than 10% of the patients and included dysosmia, headaches, diarrhea, influenza-like symptoms, and rash. An open label study and several randomized, double-blind studies reported a significant reduction in pain, number, and duration of aphthae and frequency of episodes after a course of levamisole. Thus, Levamisole hydrochloride may reduce healing time and reduce the number of ulcers with its immune regulation and improve hematologic picture, and thus can be considered as one of the drugs for the treatment modality of recurrent aphthous stomatitis. Pentoxifylline is an anti-inflammatory, immunomodulatory, methylxanthine derivative that blocks neutrophil adherence and is indicated for peripheral vascular disease. It also has been used to treat infectious diseases, immunodeficiency, hypercoagulable states, a diverse group of cutaneous diseases, and RAS. Mechanism of action appears to be due to inhibition of tumor necrosis factor (TNF) and other inflammatory cytokines. Several small uncontrolled trials utilizing pentoxifylline, 400 mg 3 times daily, have reported excellent results, some with long-term benefits. A 60-day, randomized, double-blind, placebo-controlled trial with a 60-day no treatment follow-up done by Martin H. Thornhill et al. showed that patients taking pentoxifylline had less pain and reported smaller and fewer ulcers compared with baseline. Patients taking placebo reported no improvement in these variables. Patients taking pentoxifylline also reported more ulcer-free days than those taking placebo. However, pentoxifylline did not prevent the ulcer episodes from occurring or result in a long-term cure. Minor adverse reactions to pentoxifylline include nausea and vomiting, which resolve when the drug is discontinued. However, caution should be exercised while prescribing the drug to patients taking ketorolac, theophylline, or antihypertensive medications except diuretic and systemic conditions such as pregnancy, hypotension, ischemic heart disease, acute myocardial infarction, cerebral or ocular hemorrhage, renal or hepatic failure, porphyria, or allergy to pentoxifylline. Due to the low therapeutic window and side effects and the high cost of the drug, pentoxifylline is not recommended as the drug of the first choice for treatment of RAS, although it may have a second-line role in the management of patients unresponsive to other treatments or as an adjunct to other treatments. Colchicine primarily indicated for the treatment of acute gouty arthritis has a wide spectrum of anti-inflammatory actions for disorders characterized by the accumulation of polymorphonuclear leukocytes and thus may explain the benefits obtained in several open studies utilizing continuous colchicine therapy in the prevention of RAS. According to Lynde and Rogers III (2009) in a retrospective study of 55 subjects with complex aphthosis patients received colchicine, dapsone, or both. Of the 50 patients who received colchicine alone, 30 (60%) achieved therapeutic success, and no longer needed further treatment. In this subset of patients with success, 29 (97%) had at least 75% improvement, and one 11 patient (3%) had complete resolution of symptoms. Of the 50 patients initially receiving colchicine alone, 13 (26%) had no response to the medication and 7 (14%) had adverse effects leading to their discontinuation of therapy. The most common adverse effect with colchicine was diarrhea (31%; 16 of 52) causing 4 (8%) to stop therapy. Other adverse effects occurred in five patients. These included a burning sensation in the feet and transient thrombocytopenia, which did not require therapy discontinuation, although the occurrence of rash with elevated liver enzyme levels, easy bruising, and vomiting required discontinuation. The authors determined that these results offer promise for colchicine as an effective first-line nonsteroidal therapy for complex aphthosis, concluding that colchicine therapy can be maintained long-term since it is safe and well-tolerated with regular follow-up and monitoring. It is an antioxidant which exerts its effects primarily through suppression of inflammatory cell migration. Dapsone is an effective second-line steroid-sparing drug in the systemic treatment of RAS. In an open-label, 4-year clinical trial of 21 consecutive patients with severe RAS by Mimura et al., dapsone was given to nine patients, of which 8 showed excellent to moderate improvement of symptoms. The drug has to be discontinued for 6 of those patients due to moderate to severe side effects, and 3 of them remained ulcer-free without medication for 9 months. Sharquie et al. in a double-blind, placebo-controlled, cross-over study, treatment with dapsone showed a significant improvement, and it was effective when used along with colchicines. Dapsone should not be administered to patients with a glucose-6-phosphate dehydrogenase deficiency, and careful monitoring for hemolytic anemia is also essential. Intermittent administration of ascorbic acid and the reduction of smoking are useful in averting hematologic side effects. Thalidomide inhibits the production of various cytokines as a result of its effects on T lymphocytes, monocytes, and polymorphonuclear cells and selectively inhibits the production of TNF. Due to its potentially serious teratogenic and neurologic adverse effects thalidomide was initially used only in HIV-positive patients with recurrent ulcers. However, due to it good results in controlling the recurrence of aphthosis it is now being used in HIV-negative patients with severe form or recalcitrant aphthous ulcers. The drug can only be dispensed by registered pharmacies and healthcare professionals who are required to follow the system for thalidomide education and prescribing safety program. This program includes mandatory informed consent, education procedures, and limitation of the quantity dispensed. Initial treatment in either HIV-positive or HIV-negative patients should be 100–200 mg of thalidomide daily, depending on the severity of lesions and the patient's tolerance. Once remission has been accomplished, therapy may be stopped until ulcers recur. If there is a recurrence, the initial regimen should be repeated until remission, and then a maintenance dosage of 50–100 mg daily or 50 mg every other day should be attempted. The maintenance dosage should be tapered as much as possible to minimize side effects. In HIV-seropositive patients, aphthous ulcers were completely or partially resolved in 55% and 34%, respectively, at the dose of 100 or 200 mg/day of thalidomide-treated patients. They had diminished pain, an improved ability to eat, and an average weight gain of 4 pounds in 4 weeks. In patients with severe RAU, thalidomide treatment resulted in complete resolution of aphthae in 48% of patient and improved function. In the three trials, adverse effects of thalidomide resulted in the discontinuation or interruption of therapy in 6–26% of patients. The adverse events most frequently associated with thalidomide were neurosensory, gastrointestinal, and cutaneous. Less severe adverse effects, including sedation, headache, weight gain, nausea, constipation, and rash, are reversible when the drug is discontinued. Once controlled, the dose may be tapered to alternate-day or every 3rd-day therapy. In two trials involving difficult cases, thalidomide completely healed 48–55% of patients compared with 7–9% of patients receiving placebo. According to Mimura et al., in open trial thalidomide was administered to a total of eight patients for a time period ranging from 3 to 6 months (mean, 4.8 months). It worked very well in most cases, 7 (87.5%) of which resulted in complete remission of RAS, one patient presented no response. The percentage of complete remission obtained for these patients was much higher than that reported by other authors. Adalimumab is a recombinant, fully humanized IgG1 monoclonal antibody that binds specifically to TNF-α, preventing the cytokine from binding to its p55 and p75 receptors, and therefore, neutralizing the activity of the cytokine. To the best of our knowledge, this is the first report demonstrating the effectiveness of adalimumab for the treatment of RAS. There are several advantages to using this agent. First, it binds to TNF-α with greater affinity than does etanercept, 18 providing a more complete blockage of TNF-α. Second, it is dosed subcutaneously, making it more convenient for patients than infliximab, which requires an intravenous infusion. Finally, it is a fully humanized product, so the probability of neutralizing antibody development is low. Etanercept, a dimeric fusion protein combining the extracellular portion of the human TNF receptor (p75) linked to the Fc portion of IgG. Robinson and Guitart reported a 50-year-old woman with partial improvement in chronic RAS after biweekly subcutaneous injections of etanercept [Table 1]. Management of recurrent ulcers was a therapeutic challenge to oral physicians until a decade ago. With the better understanding of the immunologic basis of the disease, various systemic agents have been used with considerable success. A definitive cure for RAS is within reach with the advent of the development of newer agents in the form of monoclonal antibodies. Further researches in the form of clinical trials involving many systemic agents will facilitate a complete conquer of the disease in the near future. Scully C, Gorsky M, Lozada-Nur F. The diagnosis and management of recurrent aphthous stomatitis: A consensus approach. J Am Dent Assoc 2003;134:200-7. Natah SS, Konttinen YT, Enattah NS, Ashammakhi N, Sharkey KA, Häyrinen-Immonen R. Recurrent aphthous ulcers today: A review of the growing knowledge. Int J Oral Maxillofac Surg 2004;33:221-34. Reichart PA. Oral mucosal lesions in a representative cross-sectional study of aging Germans. Community Dent Oral Epidemiol 2000;28:390-8. Kleinman DV, Swango PA, Niessen LC. Epidemiologic studies of oral mucosal conditions – Methodologic issues. Community Dent Oral Epidemiol 1991;19:129-40. Pedersen A, Hougen HP, Kenrad B. T-lymphocyte subsets in oral mucosa of patients with recurrent aphthous ulceration. J Oral Pathol Med 1992;21:176-80. Casiglia JM. Recurrent aphthous stomatitis: Etiology, diagnosis, and treatment. Gen Dent 2002;50:157-66. Porter SR, Scully C. Aphthous stomatitis – An overview of aetiopathogenesis and management. Clin Exp Dermatol 1991;16:235-43. Woo SB, Sonis ST. Recurrent aphthous ulcers: A review of diagnosis and treatment. J Am Dent Assoc 1996;127:1202-13. Field EA, Allan RB. Review article: Oral ulceration – Aetiopathogenesis, clinical diagnosis and management in the gastrointestinal clinic. Aliment Pharmacol Ther 2003;18:949-62. Ruah CB, Stram JR, Chasin WD. Treatment of severe recurrent aphthous stomatitis with colchicine. Arch Otolaryngol Head Neck Surg 1988;114:671-5. Eversole LR. Immunopathology of oral mucosal ulcerative, desquamative, and bullous diseases. Selective review of the literature. Oral Surg Oral Med Oral Pathol 1994;77:555-71. Ship JA, Chavez EM, Doerr PA, Henson BS, Sarmadi M. Recurrent aphthous stomatitis. Quintessence Int 2000;31:95-112. Ship JA. Recurrent aphthous stomatitis. An update. Oral Surg Oral Med Oral Pathol Oral Radiol Endod 1996;81:141-7. Chandrasekhar J, Liem AA, Cox NH, Paterson AW. Oxypentifylline in the management of recurrent aphthous oral ulcers: An open clinical trial. Oral Surg Oral Med Oral Pathol Oral Radiol Endod 1999;87:564-7. Rodu B, Mattingly G. Oral mucosal ulcers: Diagnosis and management. J Am Dent Assoc 1992;123:83-6. Barrons RW. Treatment strategies for recurrent oral aphthous ulcers. Am J Health Syst Pharm 2001;58:41-50. Eisen D, Lynch DP. Selecting topical and systemic agents for recurrent aphthous stomatitis. Contin Med Educ 2001;68:201-6. MacPhee IT, Sircus W, Farmer ED, Harkness RA, Cowley GC. 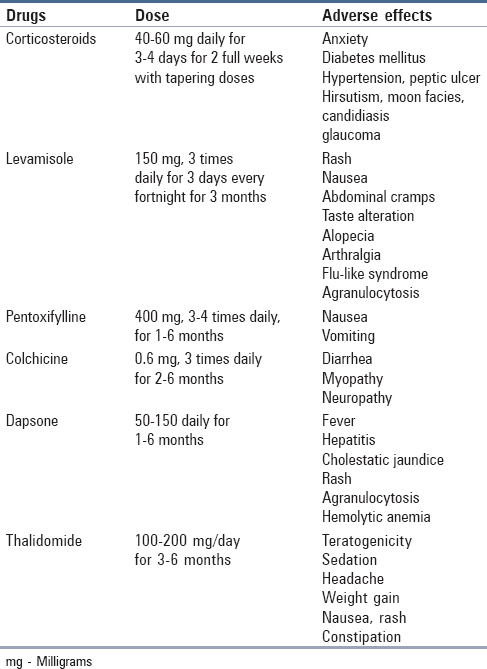 Use of steroids in treatment of aphthous ulceration. Br Med J 1968;2:147-9. Mimura MA, Hirota SK, Sugaya NN, Sanches JA Jr, Migliari DA. Systemic treatment in severe cases of recurrent aphthous stomatitis: An open trial. Clinics (Sao Paulo) 2009;64:193-8. Sharma S, Ali FM, Saraf K, Mudhol A. Anti-helminthic drugs in recurrent apthous stomatitis: A short review. J Pharm Bioallied Sci 2014;6:65-8. Thornhill MH, Baccaglini L, Theaker E, Pemberton MN. A randomized, double-blind, placebo-controlled trial of pentoxifylline for the treatment of recurrent aphthous stomatitis. Arch Dermatol 2007;143:463-70. Pakfetrat A, Mansourian A, Momen-Heravi F, Delavarian Z, Momen-Beitollahi J, Khalilzadeh O, et al. Comparison of colchicine versus prednisolone in recurrent aphthous stomatitis: A double-blind randomized clinical trial. Clin Invest Med 2010;33:E189-95. Lynde CB, Bruce AJ, Rogers RS 3rd. Successful treatment of complex aphthosis with colchicine and dapsone. Arch Dermatol 2009;145:273-6. Altenburg A, Abdel-Naser MB, Seeber H, Abdallah M, Zouboulis CC. Practical aspects of management of recurrent aphthous stomatitis. J Eur Acad Dermatol Venereol 2007;21:1019-26. Sharquie KE, Najim RA, Al-Hayani RK, Al-Nuaimy AA, Maroof DM. The therapeutic and prophylactic role of oral zinc sulfate in management of recurrent aphthous stomatitis (ras) in comparison with dapsone. Saudi Med J 2008;29:734-8. Sarmadi M, Ship JA. Refractory major aphthous stomatitis managed with systemic immunosuppressants: A case report. Quintessence Int 2004;35:39-48. Vujevich J, Zirwas M. Treatment of severe, recalcitrant, major aphthous stomatitis with adalimumab. Contin Med Educ 2005;76:129-32. Robinson ND, Guitart J. Recalcitrant, recurrent aphthous stomatitis treated with etanercept. Arch Dermatol 2003;139:1259-62.